We verified applying antibiotic ointments to your nostrils is not guaranteed to protect you from catching the flu. Does putting antibiotic cream in nostrils prevent the flu? Flu activity is on high alert in Virginia and Maryland, according to the latest CDC report. So when one of our viewers asked us to check out a social media rumor about antibiotic creams preventing the flu, we passed it along to our Verify team for answers. Cold and flu season is in full swing so we're here to get you the facts on what social media tips are worth your time and which ones you should ignore. 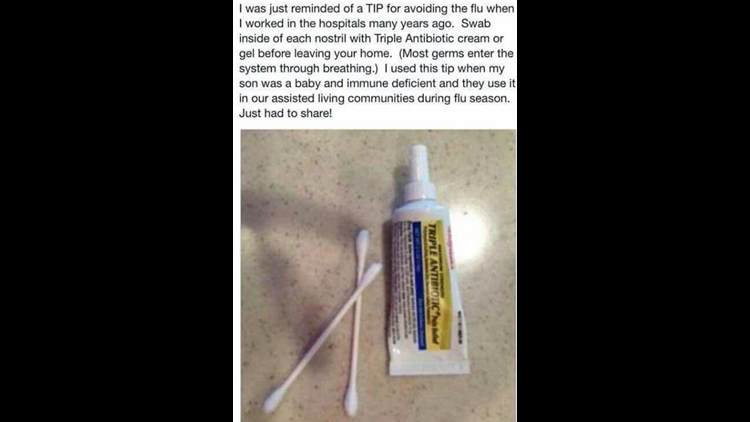 A circulating social media post on Facebook gives advice that says to avoid catching the flu, apply antibiotic cream inside each of your nostrils since most germs enter your system through breathing. First we went to the CDC, where a spokesperson told Verify researchers an antibiotic cream would not be effective in preventing the flu, because antibiotics are used to treat bacterial infections so they wouldn't prevent the flu which is prevented by taking antiviral drugs. Dr. Gary Simon, professor of medicine at the George Washington School of Medicine and Health Sciences told WUSA9 News researchers, "This is not viable. Influenza is a virus, not a bacteria. Triple antibiotic ointment contains drugs that are effective against bacteria, but have no effect on viruses." So after talking to our experts, we verified applying antibiotic ointments to your nostrils is not guaranteed to protect you from catching the flu.